Successfully Added Ultra HD 4K Action Camera "Clarion" - 20MP, 170 Degree Lens, Sony CMOS, Wrist Remote Control, Wi-Fi, DVR Loop Recording (White) to your Shopping Cart. With Ultra high definition recording the “Clarion” sports action camera will capture detailed footage of all your adventures. Whether its 20MP photos or 4K video you can be sure of a great result thanks to a Sony IMX078 CMOS sensor. This ensures sharp images, fantastic color depth and the perfect white balance for super fine quality images. The 170 degree wide angle lens fits in panoramic vistas and stunning backdrops to your hi paced action shots that can be recorded in fantastic detail. 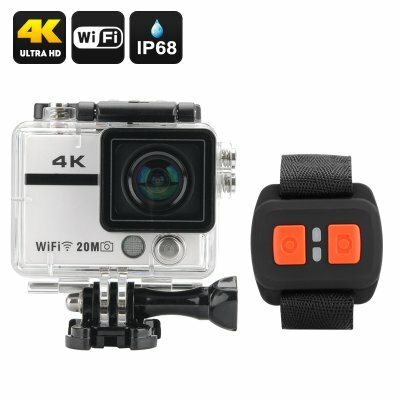 Using H.264 compression will this action camera will compress recordings without any loss to quality and allow you loads of storage as its micro SD card slot has support for up to 32GB cards. The “Clarion” action camera has a 2 inch rear TFT screen letting you review the footage and pictures directly on the camera and allowing you to line up shots and photo shoots effortlessly. Wi-Fi support makes sharing and transferring your recordings quick and easy without the need for any leads or cables. For quick easy photography when you’re in the thick of the action you can rely on the wrist strap remote trigger. At the touch of a button you can start and stop the recording or snap photos with complete ease. The cameras waterproof case offers water resistance down to 50 meters so diving trips and water sports will never look better with this 4K action cam. With an auto ignition start up this sports action camera can be used in your car as a DVR so you can record your road trips and will provide ample high definition footage to refute any erroneous claims in case of an accident. The “Clarion” Ultra HD 4K Action Camera comes with a 12 months warranty, brought to you by the leader in electronic devices as well as wholesale action cameras..